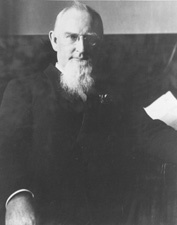 CARTER, Thomas Henry, a Delegate, a Representative, and a Senator from Montana; born near Portsmouth, Scioto County, Ohio, October 30, 1854; moved with his parents to Pana, Ill.; attended the common schools in Illinois; engaged in farming, school teaching, and railroading; at the same time studied law and was admitted to the bar; in 1882 moved from Burlington, Iowa, to Helena, Mont. ; elected as a Republican Delegate to the Fifty-first Congress and served from March 4, 1889, to November 7, 1889, when the Territory was admitted as a State into the Union; elected as its first Representative and served from November 8, 1889, to March 3, 1891; chairman, Committee on Mines and Mining (Fifty-first Congress); unsuccessful candidate in 1890 for reelection; Commissioner of the General Land Office 1891-1892, when he was elected chairman of the Republican National Committee; elected as a Republican to the United States Senate and served from March 4, 1895, until March 3, 1901; chairman, Committee on Relations with Canada (Fifty-fourth Congress), Committee on the Census (Fifty-fifth and Fifty-sixth Congresses); appointed by President William McKinley a member of the board of commissioners of the Louisiana Purchase Exposition and served as its president; again elected as a Republican to the United States Senate and served from March 4, 1905, to March 3, 1911; not a candidate for reelection; chairman, Committee on Organization, Conduct, and Expenditures of Executive Departments (Fifty-ninth and Sixtieth Congresses), Committee on Expenditures in the Department of State (Sixtieth Congress), Committee on Irrigation and Reclamation of Arid Lands (Sixty-first Congress); chairman of the United States section of the International Joint Commission created to prevent disputes regarding the use of boundary waters between the United States and Canada from March 1911 until his death in Washington, D.C., September 17, 1911; interment in Mount Olivet Cemetery. Dictionary of American Biography; American National Biography; Roeder, Richard B. Thomas H. CarterSpokesman for Western Development." Montana 39 (Spring 1989): 23-29.